damaged floors and wall plaster, and can be expensive to repair. We assess your damage and can quickly agree the extent of repairs necessary. 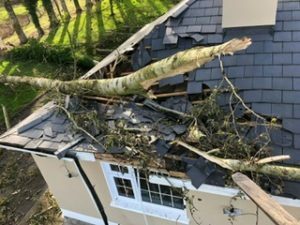 Storm damage is generally caused by gale force winds resulting in structural damage and rain water accessing the property. Unfortunately, damage can occur as a result of wear and tear (particularly to felt roof coverings). This is not ‘storm damage’ and is thus excluded from the cover provided by the policy. Similarly, damage to gates and fences is excluded. Without expert advice on your side, you may well be fobbed-off when you try to go it alone. It is important to have the roof examined to determine the extent of repairs necessary. A roofer’s report and repair estimate will be required to support your claim. You should carry out emergency storm damage repairs, in order to prevent further damage to the property. It is best if photographs can be taken before any emergency storm damage repairs are carried out so as not to prejudice your position. We offer professional advice to you and there is no obligation following a free initial consultation to assess your loss or damage. ‘Contact us’ and one of our experienced Property Claims Consultants will discuss the issues with you to see how we can help you with your claim.